Ferrari. One word says it all. It is a word that transcends all others in automotive history. Even non-gearheads know what a Ferrari is. Religion? Obsession? Sickness? It all depends upon perspective, but you have to hand it to those at Ferrari for maintaining the fanatical following that Ferrari has managed to cultivate through the years. 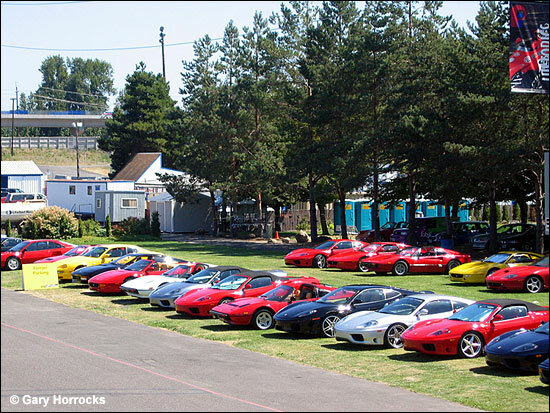 It was at Portland International Raceway last weekend that I had a chance to witness the fanaticism of Ferrari owners first hand, as Ferrari North America invaded the circuit. Among the activities of the week would be the finale in the F430 Championship, as well as a rally through the surrounding area for owners who chose to sign up. It seemed anywhere I walked, the Cavalino was visible and prominent. Hats, shirts, shoes. Anywhere you could imagine. “The Cavalino is among the most recognizable trademarks in the world.” All this from a company that ‘only’ sold 1,420 units in the US and 5000 worldwide in 2005. 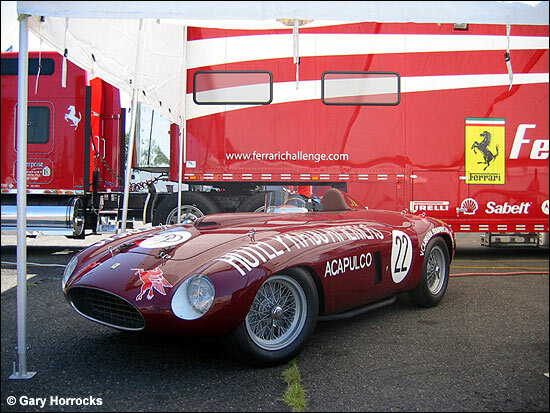 As has been the tradition since Ferrari started, it is the street cars that are secondary to the racing. “We at Ferrari build cars for the street for one purpose – to go racing.” And as Formula 1 is expensive, so are their cars. And Ferrari intends to keep it that way. “We have no intention of making a lesser expensive model.” There is no need for Ferrari to do so. 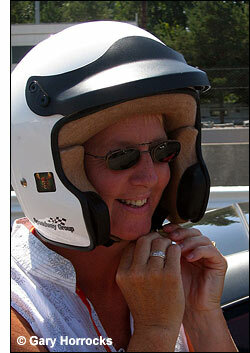 With this in mind, I think you can see how Ferrari Racing Days are orientated. 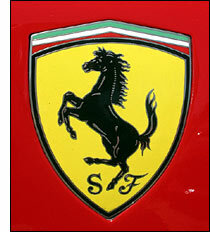 It is all about the status symbol that a Ferrari is. 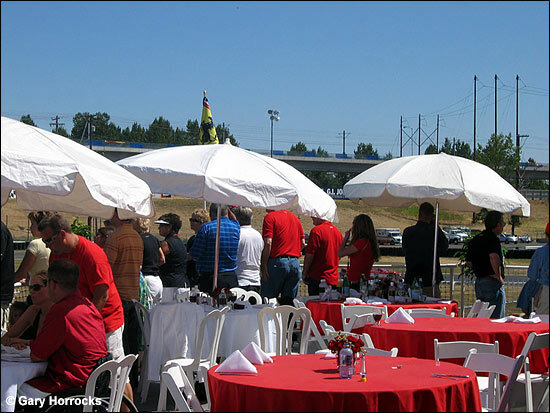 It is about Ferrari owners getting together and enjoying themselves, knowing that they are part of an exclusive club. And it is all about Ferrari catering to that. 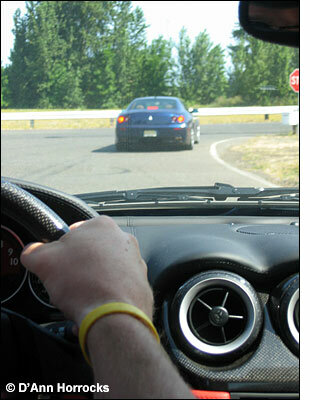 Drivers are given opportunities to take their cars on track. There are social outing and events all week long that cater to the clients and allow the clients to spend more money on their religion, obsession or sickness. But what about the cars themselves? 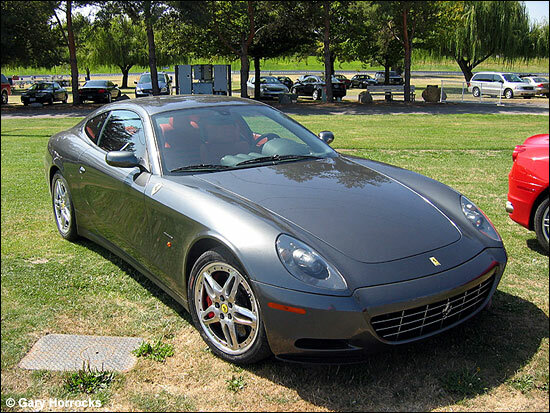 I got the opportunity to drive a 612 Scaglietti, equipped with paddle shift and ceramic brakes. Intimidating stuff to someone that drives a Ford Explorer and is working on an older Mustang. But I’m getting ahead of myself here. The 612 is what Ferrari considers to be a true four-seater, not a 2+2. It is almost entirely constructed of aluminum and is powered by a nearly 6 liter (5748 cc) V12 that makes 532 hp at 7250 rpm and 433 ft-lb of torque at 5250 rpm. Even with a curb weight of over 4100 pounds, this thing gets up and moves. 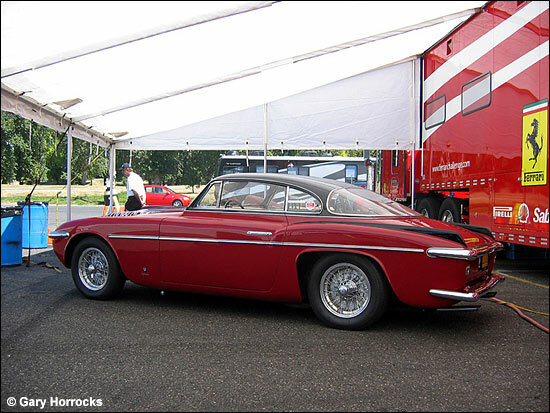 After a short familiarization talk concerning the car and its features, it was off to drive. Of course, I was first up and the intimidation factor, especially considering the paddle shifting, was weighing heavy on me. I was afraid of doing something foolish and almost considered asking to use the fully automatic mode. Thankfully, I didn’t. 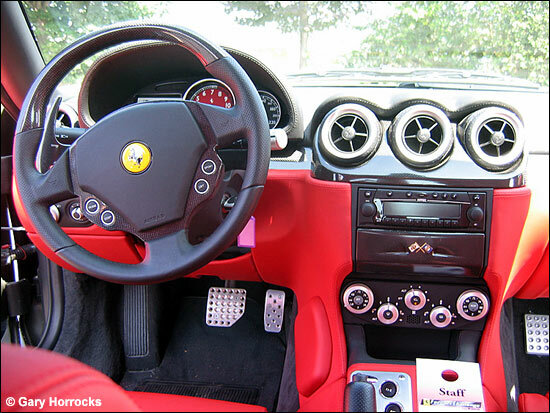 The paddle shift technology applied here comes from the lessons Ferrari has learned from the Formula 1 program, and appropriately, has named it F-1a, with the a standing for the automatic mode. Simplistically described, the gearbox is controlled by two paddles mounted on the steering column. The one on the right side controls upshifts and the one on the left controls the downshifts. There is no clutch pedal to worry about and the technology allows for shifting to occur with the go fast pedal flat on the floor. So, off we go, and after just a bit of nervousness, everything became second nature - that is if you could consider driving an almost $300,000 car in that way. In the short drive, it was amazing how the size and weight of the car almost disappeared. Yeah, I think I could get used to this. Even the shifting that I was intimidated by became natural. Just once, to see what would happen, I smashed the throttle down, flicked the paddle for second and repeated this going into third, where I shut it down, fearful of getting a ticket. Sure enough, just around the corner, a cop car was coming my way, but there was no problem. I shut down in time. Soon the drive was over and it was my time to join my wife in the back seat. OK, it’s not what you think. Besides, the seats are rather confining. Not much action to be had back there… Yes, it can be considered a four seater, but only if the driver is not too large or if the passenger has no feet. In the limited time of the drive, yes, I can say that the car was impressive to drive. Did I push it anywhere near its limits? No way. I just cannot see how a car like this can be driven even close to its limits on the street. At least if the driver wants to keep his licence. On the track, that’s a different story. 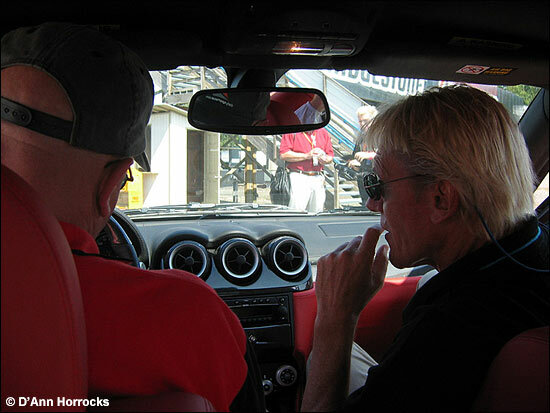 Later that day, both my wife and I were able to enjoy laps around PIR in the same car, but pedalled by a professional driver. This was a bit of an eye opener as this is where the car can really strut its stuff. The power, the brakes, the handling – everything was impressive. 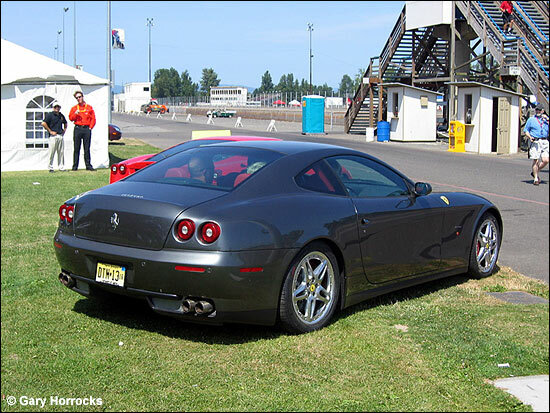 Even though the driver was quite casual about it, the 612 was driven hard and slid through the slick Portland corners at quite some impressive angles, even finding the curbs a bit in the process. Impressive, very impressive, but what else would you expect? As I went first, after my ride, I waited for my wife to return and her smile was visible for quite a distance as the car pulled into the pit lane. This was something she really enjoyed. 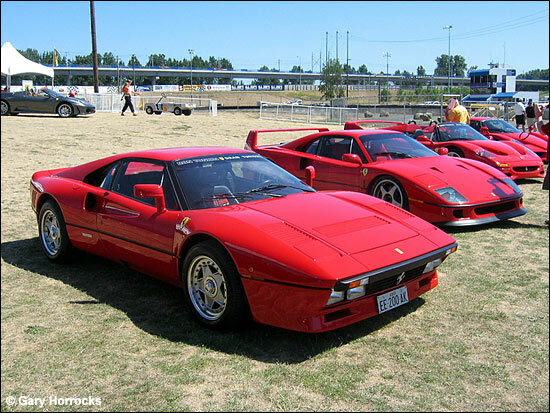 The rest of the day consisted of walking the area, looking at the gathering of various Ferraris that were at the track and also watching the general population, strutting their loyalty to the marque. Shirts, pants, shoes, all in the various Ferrari colors and designs. It was like you stood out if you weren’t wearing anything with a Ferrari insignia on it. After lunch trackside, Italian of course, it was time to head back home to my normal mundane existence, driving my normal mundane Explorer, back to my normal, mundane house. Made me think of the Joe Walsh song, “Ordinary Average Guy”. But there for at least a while, I felt like one of the privileged. 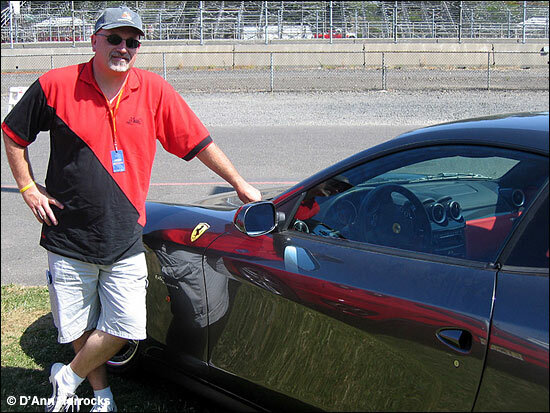 I mean, after all, I drove a Ferrari. So, does a Ferrari make sense? To me, no. I have more pressing needs for my money, and even then, I don’t have enough to even consider or realistically think about owning one. But I could still dream, I guess. As much as I hate to admit it, I guess I’m glad there are people well off enough to afford to keep companies like Ferrari going strong. Will other cars do a comparable job, getting you to and fro? Of course they will. Like most things in life, it all comes down to what you can afford and justify…but you can still dream.